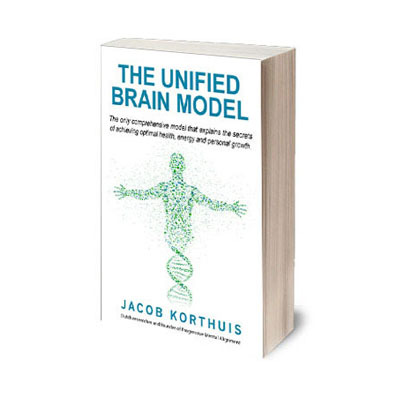 The Unified Brain Model is in de Engelse taal geschreven en in Nederland alleen als e-book verkrijgbaar. "This powerful insight has led to a cutting edge technique that works with these programs to improve our actions, behaviors and health in dramatic and permanent ways. This is a MUST READ for therapists, counselors, doctors, patients, coaches, and for all those who are searching for permanent solutions, permanent changes. "The basic rules of the operating system of our subconscious brain are of a stunning simplistic beauty. The implications however are enormous and mindboggling because they involve literally everything we do. This book presents the first harmonious model of how the brain works and how you can take control over your life. It truly deserves the title The Unified Brain Model." http://PMAInstitute.com "If Jacob Korthuis would ever receive the Nobel Prize, I would definitely not be surprised!! " "The book has given me insight into how the brain works and the consciousness that influences the functioning of the brain on me as a person, what I feel, my decisions, my preferences, what I do and why. Because of this I have come to understand myself and others better what the real cause is of certain behaviour and way of thinking and convictions." "The insight of this book made me realise that you can get back in control of your own life. It Made me aware of my own sabotaging mechanisms. Therefor I can change and adjust my inhibitory behaviour in progressive behaviour. I can absolutely recommand this method. Not only for personal growth but also for satisfaction and happieness workwise. For me, a great advantage is that it’s super effective and straight forward." "Really well explained book about how our brain works! Must read if you want to take your life to the next step it needs. Take your time to read it. Some information is pretty confronting."